A California court has ruled that drivers can use mobile devices to check maps while behind the wheel, narrowing the interpretation of a state law that prohibits cellphone use while driving. The case involves a driver, Steven Spriggs, who was pulled over in California after using his iPhone to look at a maps app while stuck in traffic. An officer interpreted the driver’s actions as in violation of the law, resulting in a $165 ticket. The judges overseeing the case in the California 5th District Court of Appeal reversed Sprigg’s earlier conviction, ruling that the law is specifically applied to “listening and talking” on a cellphone while driving. “Then it would be a statutory violation for a driver to merely look at the telephone’s display,” the ruling said. Most states have laws that ban texting and talking while driving, unless using a hands-free device, however many of the provisions were written before cellphones were used for other purposes, such as replicating the functionality of an in-car navigation system. Audi has published a new teaser image of the third-gen TT. The coupe will bow in less than a week at the Geneva Motor Show. The image confirms the next TT’s fluid silhouette is inspired by the first-gen model introduced in 1998. It gains a sharper front fascia characterized by angular headlights and a chiseled hexagonal radiator grille, two styling cues that will define Audi’s next design language. The company’s trademarked four-ring emblem has been moved from the grille to the hood. LED headlights will be available at an extra cost, and buyers in Europe will be able to order the TT with Audi’s Matrix beam technology. All models will be equipped with LED tail lamps. Earlier spy shots confirm the new TT will adopt a back-to-the-basics cockpit with an increased focus on driving pleasure. It will eschew a traditional center stack in favor of a simpler setup with just a few knobs and buttons for the HVAC controls, and the current TT’s static LCD screen will be replaced by a retractable unit to create a clean, uncluttered look. The TT will be offered with a host of high-tech options including the latest generation of Audi’s infotainment system, a heads-up display and a Wi-Fi hotspot. Look for the 2015 TT to come standard with a 220-horsepower version of Audi’s 2.0-liter turbocharged four-cylinder engine. The more expensive TTS will use a 300-horsepower four-banger while the range-topping TT-RS will be powered by a 380-horsepower five-cylinder mill. Both front- and all-wheel drive will be offered, and buyers will be able to choose between a six-speed manual transmission and a dual-clutch DSG unit. The 2015 Audi TT will go on sale in Europe and the United States next fall. A convertible version will likely be presented later this year at the Paris Motor Show and land in showrooms in early 2015. Nissan is reportedly preparing to ramp up its US manufacturing capacity to minimize the need for imports in the second-largest automotive market. Speaking to reporters in Detroit, Nissan’s VP of sales and marketing for the US, Fred Diaz, suggested that the company aims to manufacture 85 percent of its US sales volume within the country “in the very near future,” as quoted by The Detroit News. The executive suggests Nissan began increasing investment in North American manufacturing during the recent recession, spending approximately $5 billion to expand production in the US and Mexico. The strategy is said to have added 8,000 jobs in the US over the past five years, increasing capacity by 22 percent and boosting exports by 100,000 units. The shift is said to be part of a broader strategy aimed at improving the Japanese automaker’s reputation with buyers and dealers, though it is also expected to improve the bottom line. Alongside the manufacturing changes, the company will also be relying on a handful of redesigned models to help it grow market share in the US and abroad. A new Maxima and Titan are expected to arrive within the next year, while the Rogue and Murano are set to arrive sooner. Maserati to debut F-Type rival in Geneva? Maserati’s long-awaited sub-GranTurismo sports car may finally be on the verge of making its debut. The trident brand will unveil its answer to the Jaguar F-Type and Porsche 911 at next week’s Geneva Motor Show, according to a GTSPIRIT.com report that does not cite sources. Rumors referenced by Car and Driver suggest that the sports car will ride on a shortened version of the Ghibli and Quattroporte’s platform and utilize the sedans’ twin-turbocharged 3.0-liter V6 and/or 3.8-liter V8 engines. While Maserati has declined to comment on the alleged debut, the automaker has been making noises for some time about a two-door that would be smaller, less expensive and more driver-focused than the GranTurismo. Last year, Maserati CEO Harald Wester stated that the brand needed a higher-volume sports car to compliment the niche-selling GranTurismo. Prior to that, a leaked product plan sheet also suggested that Maserati was plotting a 911 rival. This year is Maserati’s 100th on the market, a milestone that would certainly lend itself to the introduction of an important new model. Of course, none of that confirms that the sports car will arrive in Geneva, so we’ll just have to wait and see what next week holds. Nissan has announced a new “Smart” rearview mirror that doubles as an LCD monitor for camera feeds. When the LCD function is activated, the full width of the mirror converts to an ultra-wide monitor showing a view from the rear-facing camera located on the back of the vehicle. The image from the rear camera is claimed to provide a wider field of vision, giving an unobstructed look at the rear flanks without being blocked by C-pillars, tall passengers or cargo. It is also said to show a clear image in a variety of conditions, automatically adjusting for glare, bright headlights or other factors. The 4:1 aspect-ratio LCD is integrated directly behind the mirror and can be switched off, enabling it to be used as a traditional rearview mirror. The company suggests it reworked the structural design of both components to avoid a double image when the monitor is active. The company plans to offer the Smart mirror as a dealer option this spring in Japan, ahead of a global rollout in 2015. 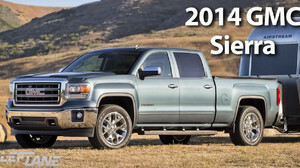 In some ways, the GMC Sierra 1500 has been given a tough lot in life. Unlike the Ram 1500, with its eight-speed transmission and air suspension, and the upcoming, aluminum-intensive 2015 Ford F-150, the Sierra does without headline-grabbing features and segment-first technologies. But dig beneath the surface, and it becomes apparent that the GMC’s latest does have a great deal to offer. Modern and attractive inside, while also being more powerful and efficient than before, the Sierra isn’t flashy – it’s just a solid, capable pickup done right. Join our Ron Doron as he takes you on an in-depth ride and drive with the Sierra 1500, and don’t forget to check out our full First Drive review and Buying Guide page for the truck. Federal investigators with the National Highway Traffic Safety Administration have opened an investigation in the the “timeliness” of General Motors’ latest recall of defective ignition switches. Automakers are required to notify the NHTSA within five days of discovering an automobile safety defect. A lawsuit aimed at the company suggests that it was aware of the defective ignition switches as early as 2004, but handled it with a technical service bulletin rather than a formal recall with safety implications. The ignition switches in affected vehicles occasionally shift to the ‘accessory’ or ‘off’ position while driving, particularly when a heavy keyring is attached to the key. In such instances, the engine turns off and the airbags, power steering, anti-lock brakes and brake assist are disabled. In its recall notice, GM acknowledges at least 31 accidents and 13 fatalities associated with the problem. The lawsuit was filed by the estate of one driver who visited a GM dealer over the problem in 2010, received no fix or temporary remedy, and then died in a car accident the very next day after her car lost power at 60 mph. GM faces potential fines of up to $35 million if the NHTSA determines that the company violated federal regulations. Less than a third of Kia showrooms in the US will reportedly receive the company’s new K900 luxury sedan. The limited availability has been partially blamed on the K900′s overhead cost to dealers, as Kia requires special training and a showroom display kit that are estimated to cost approximately $30,000 for most affiliates. Kia Motors America’s executive VP of sales and marketing, Michael Sprague, suggests the participation numbers are more likely to be explained by the luxury car market’s concentration on the East and West coasts and in the South, according to comments posted by Edmunds. Kia requires staff training to ensure that dealers can properly communicate the K900′s unique features, as the company’s first rear-wheel-drive vehicle and first V8 sedan. The Korean automaker faces tough competition from established players in the Luxury market. With its $60,000 price tag, the K900 V8 edition is $15-20,000 less than full-size alternatives from the Germans. For buyers who don’t place both size and price at the top of their priority list, however, the K900 commands a $10-15,000 premium over midsize offerings from Mercedes-Benz, BMW and Audi. After publishing a preliminary set of details about the 2015 650S that will greet the public for the first time at next month’s Geneva Motor Show, McLaren has now confirmed performance figures for the coupe edition. The 650S is designed to fill the large gap between the MP4-12C and the P1. Offered as a coupe and as a convertible, McLaren’s latest creation stands out from the 12C on which it’s based thanks to a unique front fascia that is noticeably inspired by the aforementioned P1. McLaren says the 650S gives an accurate preview of the design language that will influence all of its upcoming vehicles over the next few years. The 12C’s gill-shaped air vents have been replaced by one large vent on each side while the rear end is carried over to the 650S essentially unchanged. Model-specific alloy wheels mounted on low-profile Pirelli P-Zero tires finish off the look. The 650S boasts a sporty, well-appointed cabin whose design closely mirrors the 12C’s cockpit. Buyers with extra deep pockets can order the car with real carbon fiber trim on the dashboard, the door panels and on the steering wheel. Although it is billed as a pure driver’s car, the 650S is by no means a stripped-down track car and it comes standard with a color touch screen located on the slanted center console that groups the car’s navigation, connectivity and entertainment functions into a single unit. The list of options includes an electronically-adjustable steering column and parking sensors on both ends. Power comes from an evolution of the 12C’s 3.8-liter V8 engine that has been tuned to churn out 650 horsepower. McLaren claims a 0-62 mph time of three seconds, and acceleration up to 124 mph in 8.4 seconds. The car promises to complete a standing quarter mile in 10.5 seconds, while topping out at 207 mph. Despite the 650S’ strong performance figures, it promises to return 24.2 mpg in the European combined cycle. A complete set of details about the 650S will emerge closer to the car’s debut in Geneva. As promised, Tesla Motors has announced more details surrounding its proposed “gigafactory.” The project may prove bigger than analysts initially expected, requiring up to $5 billion in total investment through 2020. Sites in Nevada, New Mexico, Arizona and Texas are under evaluation for the 10-million-sq-ft factory, which will spread across as many as 1,000 acres. It will utilize solar and wind power, generated on-site, and employ up to 6,500 people. The company aims to begin production in 2017 and ramp up to full speed by 2020, at which time the single factory will exceed the entire current annual output of lithium-ion batteries. Reaching 50-gigawatt-hour capacity is expected to be necessary for the company to reach its sales goal of 500,000 vehicles per year, while also providing battery packs for use in other industries. The ambitious numbers will also require a significant reduction in battery costs to enable a mass-market vehicle to travel 200 miles and cost less than $35,000. Once the site has been chosen, construction should begin this year.